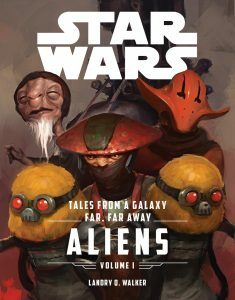 Last month, a new Star Wars book came out focussing on characters from the most recent Star Wars theatrical release, “The Force Awakens”. 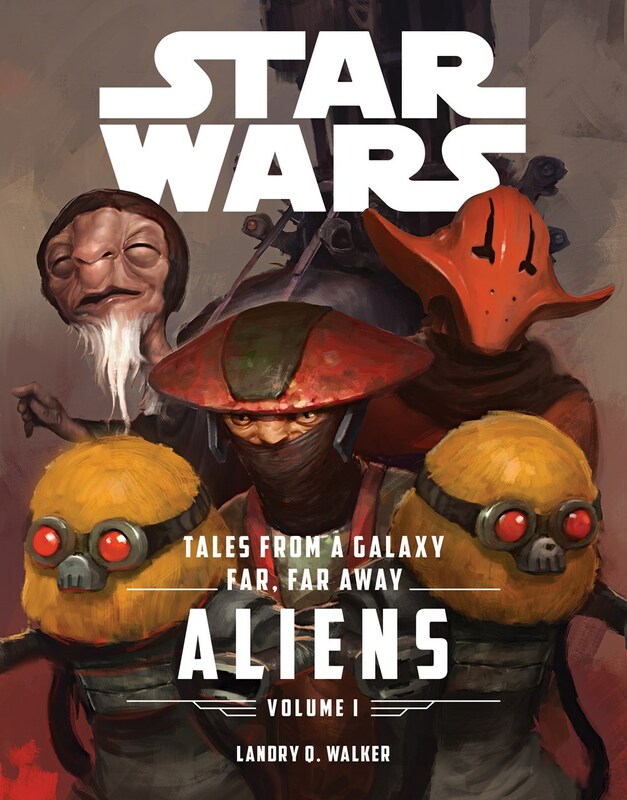 “Tales From a Galaxy Far, Far Away, Volume 1: Aliens” contains six stories about characters found on either Takodana in Maz Kanata’s castle or on Jakku. Written by Landry Q. Walker, the reading level of this book is meant for younger audiences, for readers as young as 8-12. Some of the stories are about characters we see on-screen in “The Force Awakens”, some help give a better sense of characters who may be around. 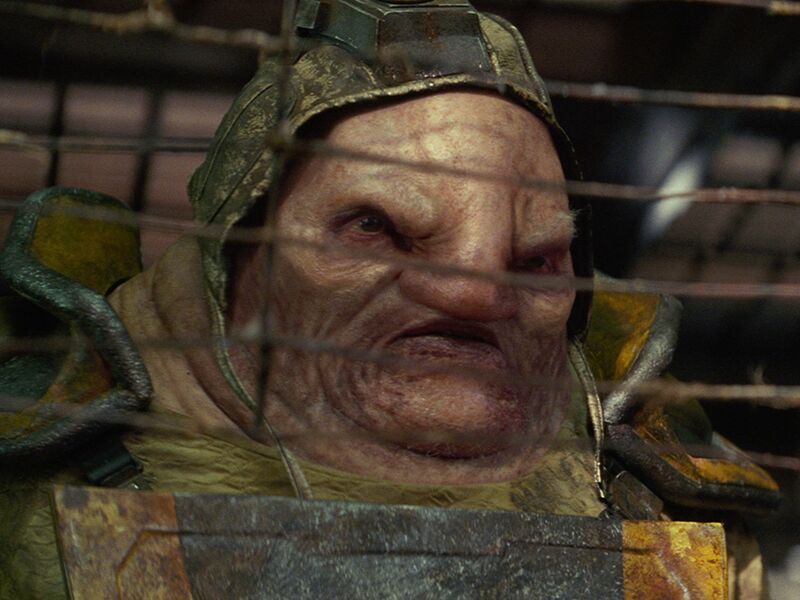 Three of the stories center on characters we see on Jakku – Bobbajo, Unkar Plutt, and Constable Zuvio (okay, so he’s not shown on-screen in the theatrical release, but maybe he’ll show up one day in deleted scenes (or a director’s cut)). “High Noon on Jakku” is a story with a Western feel to it, almost as if Constable Zuvio, upon whom the story centers, is like a sheriff in the Wild West trying to maintain peace. A financial heist is committed and, yes, shots are fired out in the desert, just like in a Western. The story about Bobbajo, “All Creatures Great and Small”, is not so much about Jakku as it is about events that took place on the Death Star during “A New Hope”. 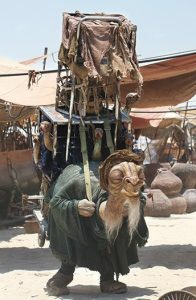 Nevertheless, it gives a better sense of the character of Bobbajo, as well as that there is a distant town on Jakku called Reestkii, which was over four hundred kilometers away from Niima Outpost. And the story centered on Unkar Plutt, “True Love”, provides us with a greater sense of Plutt’s financial wealth and power in Niima Outpost. The story is about two underlings of Plutt’s who seek to steal some of his wealth, which also involves some “online dating” for Plutt (yes, online dating). The stories about the denizens of Maz Kanata’s castle are less about the characters we see on-screen and more about who works and lives there. One familiar on-screen character, Sidon Ithano, also known as the Crimson Corsair, has a story in this collection, while two other stories are about characters who inhabit the castle, but are not found on-screen. “The Crimson Corsair and the Lost Treasure of Count Dooku” is a story much like “It’s a Mad, Mad, Mad, Mad World” in which several groups of treasure-hunters are all on a quest to reach a fallen ship of Count Dooku’s, lost amidst the Clone Wars, while fighting each other to reach it. 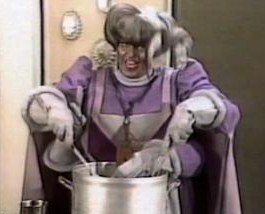 “The Face of Evil” is a creepy story, perhaps best read around Halloween, which centers on two Frigosian mad scientists who dwell in the castle. “A Recipe for Death” is a whodunnit murder mystery which is located in the kitchen of the castle. Gormaanda is now canon thanks to this book! …Tuggs had always been obsessed with the art of food preparation. When he was young, he stumbled across some ancient holovids of a four-armed culinary genius named Gormaanda. The experience had changed the young Artiodac and, before long, he had dedicated his life to his newfound passion – cooking. That path had led him across the galaxy, from one end of the Outer Rim to another, always in search of the next great recipe, seeking the next best challenge. While the chronological placement of these stories is unclear whether they take place before, during, or after the events in “The Force Awakens”, it is clear that the stories take place roughly in chronological proximity to the movie. This is in direct contrast to the stories in “Before the Awakening”, which take place in the days, weeks, and months leading up to “The Force Awakens”. A large member of the Crolute species, Plutt was at home in a deep saltwater environment. Jakku, a dry desert world where water was one of the rarest of resources, was anything buy comfortable for him. 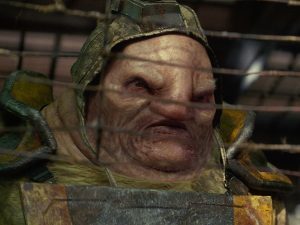 And, for that reason, Unkar rarely left the security of his heavily armored headquarters: a converted cargo crawler that served as a sort of concession stand where the impoverished citizens of Jakku could take the scrap they had salvaged from the vast starship ruins that stretched across half the planet. They traded with Unkar for equipment, food rations, and, most important, water. Zuvio was a sternlooking individual, with most of his features perpetually covered by bandages that helped his sensitive respiration system cope with the climate. His eyes were yellow with black slit-shaped pupils, and his brow was furrowed in an expression that made people think he was always angry. The secret truth of the matter was that Zuvio suffered from vision problems, common in Kyuzos, and his expression was formed from years of squinting slightly to see better. 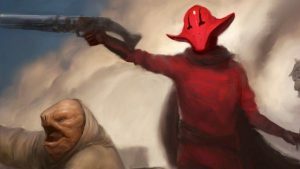 And, finally, about Sidon Ithano, we read that he’s “the most dangerous pirate ever to sail the Lost Clusters beyond the Outer Rim, the most feared fighter of the skirmish of Adratharpe 7, the most notorious thief of his species…” (p. 306). It was said that all were welcome – at least for a price. And just by glancing around the halls, Biggleston knew there were beings there with laundry lists of crimes greater than her own. But none of that mattered, a polite protocol unit had argued when she first arrived. The outlaw would not be accepted, would not be given more than the token courtesy all beings received for free: one night, no questions asked. Food, water, and shelter from the storm. After that, Biggleston would have to depart or pay some very heavy fees. The town was called Reestkii – a word that, loosely translated into Basic, meant “the leftover.” Reestkii was located near the equator of the desert world, and the only settlement on the planet worth noting – Niima Outpost – was over four hundred kilometers away. The town had no resources to mine, barely enough agriculture for the locals to survive, and not enough combined wealth to get passage on a ship to anywhere worth seeing – not that there were any ships other than the occasional bleak husk of something long before burned out. There were very few settlements of that sort – generally unknown or forgotten by the rest of the bleak world they were situated on. The role of constable was a difficult one. Despite the fact that the population of the town was relatively small, there was always someone willing to take advantage of the slightest weakness in his or her neighbor. So, as is the case with any gathering of beings, a desire for a semblance of structure slowly arose among the prospectors and scavengers who had drifted to the crumbling settlement of rickety landing bays and dusty salvage yards. And somehow, amid that attempt at self-governance, Zuvio found himself pinned with the label of constable. Not entirely isolated, Niima Outpost was thinly connected to the rest of the galaxy by means of a banking ship that was “a regular transport that arrived at the outpost every cycle to manage transactions on behalf of the Western Reaches Exchange. It usually stayed three or four rotations, then left to conduct other business. The ship served as one of the few anchors between Niima Outpost and the rest of the galaxy, and a strike against it could have heavy repercussions” (p. 10). No one controlled as much water as Unkar. And no one on the planet had any other wealth worth having. There were some stubborn holdouts who bartered their meager findings for off-world credits, and that small percentage exchanged their savings with an off-world banking company via a remote shuttle deposit/investment service. A push here, a prod there, and next thing anyone knew, all those precious credits had been robbed right out of the shuttle. All without the junk boss having to get his own hands even a little dirty. As for the rest of the population of Jakku – almost everyone – they had to trade what they found in the ship graveyards of the dry desert for life-supporting sustenance. The book, however, does not share with us why Plutt is on Jakku or how he got there, but we do read that “Unkar considered the barren wasteland that covered the majority of Jakku. He considered nearby worlds like Ponemah and Sahbrontee I that were similarly toxic and inhospitable. The Western Reaches seemed filled with the most backwater worlds anyone could ever imagine” (p. 225). As to one of the aforementioned worlds, Ponemah, the story involving the Crimson Corsair takes place there, where we read that “even by the standards of the many dry and hot desert worlds that seemed more and more commonplace throughout the galaxy…Ponemah was particularly overrun with an excess of sand” (p. 268). And, similar to Jakku, it didn’t seem to be a place that one would really care to go (p. 274): “no one lived on Ponemah because they were rich. The chance – even a life-risking, meager chance – of attaining wealth, of finding buried treasure like the one promised by the Separatist battleship? Impossible to resist.” In fact, “There was little indigenous life on Ponemah, but, as any colonist or pirate worth his salt might tell you, there is life everywhere – and it usually wants to eat you” (p. 272). Since she had left the confines of the janitor’s closet and the company of Bobbajo, Mideyean had overheard many things – most of which revolved around a man in a brown robe having a sword fight with a man in a black cape, and a computer failure that had led to some kind of mass shutdown of all the garbage smashers on the station’s detention level. The fight sounded bad, but more people seemed upset over the garbage smashers and the problems it had caused the sanitation systems. Explosions from garbage chutes had evidently been occurring on multiple levels, and the plumbing in the officers’ quarters was overflowing from every drain. In a furious discharge of energy, the droid unleashed a full volley of blaster bolts at the thwip, but it was too late, as Smeep had already easily dodged the blasts. Instead, the blaster fire struck the crystal computer core, which instantly shattered and exploded with an energy that the three desperate animals were barely able to escape. Climbing back to the corridors, the three creatures knew they had done all they could. The Death Star’s primary superlaser would no longer fire. Or, more to the point, when it did, the entire station would explode. The firing sequence had begun. The Death Star was about to destroy a helpless planet. But deep within the space station, where no one could see, a small regulator failed to divert the deadly energy to its proper destination and, instead of vaporizing the planet below, the great gun misfired – turning its world-shattering weapon inward and ripping the Death Star apart. All that was left was a shower of glowing embers, quickly fading away into the darkness of space. The evil that the Empire had constructed to terrorize the galaxy was no more, thanks to the invisible efforts of Bobbajo’s tiny friends: the unsung heroes of Yavin. It’s not clear what us readers should do about this – do we accept Bobbajo’s version? Could we accept both Bobbajo’s version and what we see in “A New Hope”? …the interesting thing about hyperdrive technology was that it typically required a specific blend of metals to resist inter-dimensional shift stress – an alloy of titanium and chromium. Titanium by itself was junk, but chromium was quite valuable. Unfortunately, because the chromium in hyperdrive construction had been blended with titanium, it was, essentially, also junk. Unless you had a very expensive machine that could melt down and separate the base elements… (p. 232). We discover the fate of CT-6116 “Kix”…. The stories in this book make for a fun read and help color in what we know about the worlds and characters in “The Force Awakens”. Next First Time Reviewing a Book on Skywalking Through Neverland!